Are you participating in too many meetings? Are these meetings too long? Time is money and group time costs much more money than the time of a single person. 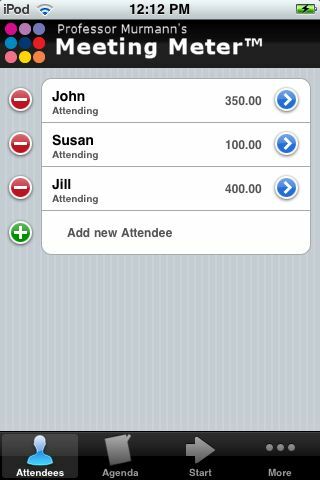 With the Meeting Meter™ you can develop an agenda and calculate the true cost of meetings while they take place. The Meeting Meter™ is a simple tool for creating more effective meetings. - Raise awareness of just how expensive meetings can be. Group meetings often drag on because the participants forget that group time is more expensive than individual time. The Meeting Meter™ increases awareness of group meeting costs and thus encourages people to be more prepared and to alter their behavior during the meeting. - Track the true cost of group discussions. When you want to encourage participants to consider whether it is worth spending more time on an issue, you can tell them how much money has already been spent on particular agenda items and the entire meeting by using the Meeting Meter™. - Manage a work group that tends to stretch out meetings. By making the Meeting Meter™ visible to all participants, you can help the work group become more focused, effective and efficient. 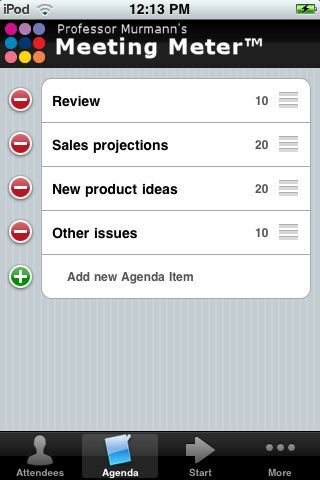 - Develop effective meeting formats. Use the Meeting Meter™ to determine most effective content format and discussion flow over time. 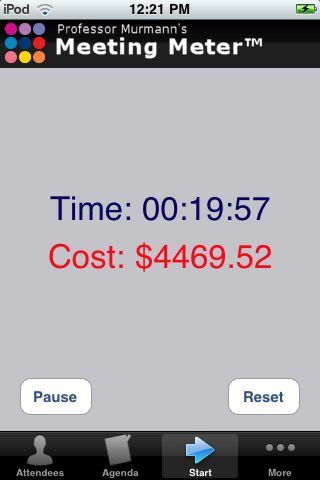 The program allows you to develop a time budget for the different items on the meeting agenda and track how well the group sticks to the budget. Save the Meeting Meter™ record of each meeting as a separate file to compare which meeting format is most effective. - Privately track the cost of meetings and assess the effectiveness of a group in allocating time to important rather than trivial decisions. - Use Meeting Meter™ as simple work meter and track how much time you have spent on particular tasks, using the agenda item list as a task list. The Meeting Meter™ cannot make decisions for you about how much time you should spend on a particular meeting. It can only provide information about how much time and money was spent on a meeting. When large sums of money or perhaps even the future of the organization are at stake, spending a bit more time in group deliberations may be time well spent. The goal of the Meeting Meter™ is to help people have more focused, purposeful, efficient and effective meetings. It assists people in allocating less time to trivial topics and enough time to important ones. Management research has shown that individuals develop a strong sense of group identity and loyalty when they spend lots of time together. Therefore, use the Meeting Meter™ to reduce inefficient group meeting time but not the overall time that people spend together. Time spent together in a worthwhile way can allow a group to become much more effective. 1. Enter at least one attendee and the person's hourly rate. 2. Hit the Start button. 3. 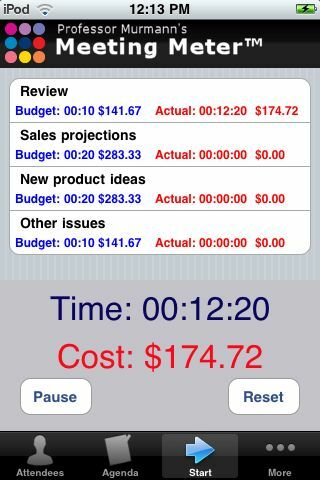 Presently the iphone OS does not allow you to work with other program while running the Meeting Meter™. The exception is playing music. 4. To time the agenda of a meeting, you need to click on the Agenda tab at the bottom of the screen. This will bring up a window into which you can enter several numerically ordered agenda items as well as the time budget in for each item. 5. Start the program in the Agenda Mode by clicking "Start." 6. The program automatically starts timing the first agenda item. To switch the timer to the desired item, you tough with your finger the second or later agenda item. More information on how to use the program can be found in the program's help file.